A puzzle box (also called a secret, or trick box) is a box that can only be opened through some obscure or complicated series of manipulations. Some puzzle boxes may require only a simple squeeze in the right spot, whereas others may require the subtle movement of several small parts, to open the box. Some puzzle boxes are comparable to burr puzzles. The puzzle box originated in the Hakone region of Japan at the turn of the 19th century as the Himitsu-Bako, or Personal Secret Box. If opened, a puzzle box usually contains a sort of good luck charm. These boxes were made in various complexities, and consist of moves with a variety of twists to trick the person trying to open the box, but the real trick is finding the correct series of movements that can range from two to 1500+ moves. Yosegi-zaiku is a type of traditional Japanese parquetry which originated in Japan’s culturally rich Edo Period. It has been increasingly well reputed in foreign countries. The mosaic work is made by making best use of natural fine grains and textures of wood. Timbers of different colors are cut into oblong rods of desired sections. 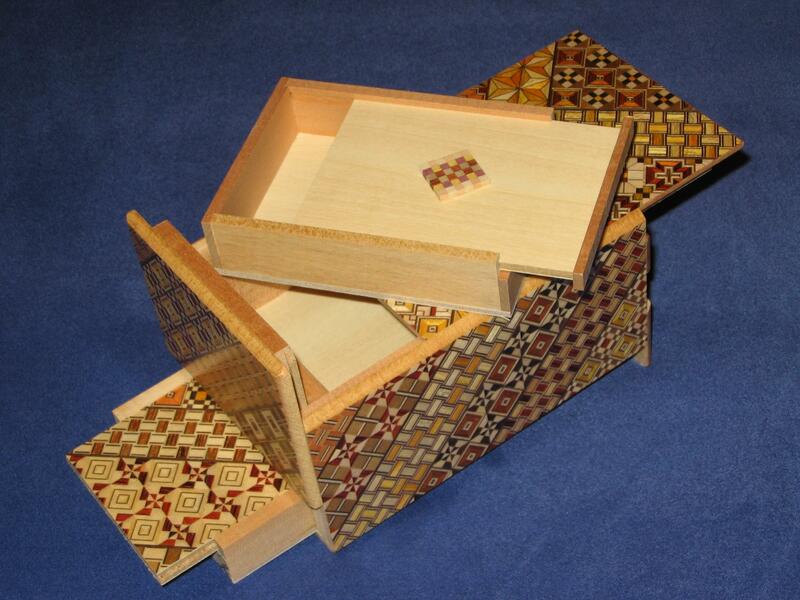 Yosegi veneers are commonly found on the outside of Japanese secret boxes (himitsu-bako) or puzzle boxes, but may also be used to decorate many other items such as trays, chests, photo frames but the most common use is to decorate the surface of the Japanese yosegi Puzzle boxes. The boxes differ in sizes and number of moves. The length is usually measured in the traditional Japanese units of measurement called the sun (pronounced “soon”), with one sun equal to approximately 3 centimetres (1.2 in), hence a “5 sun” box would measure about 15 centimetres (5.9 in) in length. Boxes are most typically between 3 and 6 sun in length. Some well-known masters pride themselves in making unique boxes that do not follow any size guidelines. Lemarchand’s box is a fictional lock puzzle or puzzle box appearing in horror stories by Clive Barker, or in works based on his original stories. The best known of these boxes is the Lament Configuration, which features prominently throughout the Hellraiser movie series. This was designed and made by Simon Sayce, one of the original creative team. A Lemarchand box is a mystical/mechanical device that acts as a door — or a key to a door — to another dimension or plane of existence. The solution of the puzzle creates a bridge through which beings may travel in either direction across this “Schism”. The inhabitants of these other realms may seem demonic to humans. An ongoing debate in the film series is whether the realm accessed by the Lament Configuration is intended to be the Christian version of Hell, or a dimension of endless pain and suffering that is original to the Hellraiser films. In the 18th century, Philip Lemarchand, a French toymaker, makes the Lament Configuration for a wealthy aristrocrat named Duc de L’Isle, who is obsessed with dark magic. He and his apprentice, Jacques, kill a woman and remove her insides from her skin, and L’Isle uses dark magic with the Lament Configuration to summon a demon princess named Angelique in the woman’s skin. She is theirs to command unless they stand in Hell’s way. However, Angelique and Jacques betray and kill de L’Isle. Lemarchand, in the process of inventing a design (the Elysium Configuration) to destroy the demons, attempts to steal back the box, but is discovered. Jacques callously informs the toymaker that he and his bloodline are cursed until the end of time because of the box he created, before ordering Angelique to kill him. However, his wife survives. Quite the collection of puzzle box videos you have here…. This is a nice post.All the above pictures are too good. Hey thanks, Surprisingly these magic boxes are really difficult to find in Japan. Puzzle boxes are fascinating!